﻿ Why Your Marketing Agency Needs to Practice What It Preaches » Red Mango Marketing! Would you hire a personal trainer that was out of shape, didn’t follow a nutritional diet, and rarely exercised? People like to hire both experts and businesses alike that practice what they preach. So, if you’re a marketer, your potential clients are going to want to see that you market your own business well, as the primary deciding factor in hiring you. It shows credibility, sets you apart from competitors, and it shows that the things you recommend for success actually work. At Constant Contact, our partner program offers resources, support, and education so you can bring on new clients, increase revenue from existing clients, and keep your clients longer. Find out how to get started today. How much of your day is spent marketing your own business? The answer from most of us is not surprising – not very much. Achieving day to day marketing victories for our clients is wonderful, but when we don’t make time to put in the same creative effort to market ourselves, our businesses lose out. Keep that same high standard for your own business and you’ll start gaining potential new clients. You’ll also get help retaining your current ones. It’s easy to make recommendations and preach best practices to existing clients. Unless we’re recommending something we actually follow ourselves, the recommendation may look like empty advice. Let’s say you suggest to your clients that you should take over handling their social media marketing to ensure consistency. You’d like to keep their brand in front of the right customers on a routine basis, rather than just posting when the mood strikes. Most clients will look to trusted expert to see what works, and if you’re only posting when the mood strikes, you stop looking like the expert. The client might not want to hire or take a suggestion from someone who doesn’t even follow their own advice. It’s no secret: showing a high level of skill in your field is the best way to increase business. Although portfolios with client work are great to ‘wow’ potential clients, the first thing potential clients view is your marketing agency’s website, social media pages, and branding. Before you even get to ‘wow’ them, you first need to convince them to give you a chance. Your target clients: Who have you worked with, and who do you want to work with, including your range of client sizes, with both a local or national reach– make sure you have a strong value proposition clearly stated on your site’s main page. Your offered marketing services: Help your potential clients get an idea of the different ways you might help their business, like email marketing, copywriting, or web development. Your design aesthetic: Give an idea of how their business may look if they decide to work with you, showcasing your style of design. Branding and voice: Highlight the same things you’d look for in a business with your range of branding and voice to keep content creative, and effective. Marketing your business will not only sharpens your skills, but it also helps you find new techniques or new trends, without having to use your clients as guinea pigs. Once you have discovered some recipes for marketing success by doing it for yourself and have worked out the kinks, you’ll be ready to share the winning formulas with potential and existing. Practice will make perfect when you market your own business, as you’ll have the ability to stay ahead of the curve by successfully navigating through and solving potential problems. Additionally, you’ll most likely make discoveries in patterns and call to actions that lend to success in engagement and increasing your client base. No matter your reason for not putting the same marketing effort into your own business as you do your clients, now is the time to make it a priority. With increased credibility, visibility, and new techniques learned, your marketing agency is sure to outshine the competition by showcasing your skills as marketing experts. 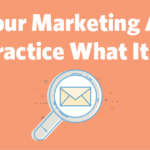 The post Why Your Marketing Agency Needs to Practice What It Preaches appeared first on Constant Contact Blogs. This entry was posted on Friday, March 30th, 2018 at 8:00 am	and is filed under Email Marketing, News & Updates, small business marketing, Solution Providers. You can follow any responses to this entry through the RSS 2.0 feed. Both comments and pings are currently closed.